This must-read book written by a Board-certified cardiologist for cardiologists clearly explains the vitamin C connection with heart disease. STOP AMERICA'S #1 KILLER! provides overwhelming scientific evidence that most conditions which we now consider as risk factors for CHD: (a) all start with the depletion of arterial vitamin C levels (arterial scurvy), and (b) are often just the body's way of compensating for the weakness in arterial walls caused by arterial scurvy. This book also offers a protocol for preventing and reversing the arterial blockages that cause heart attacks. The results of Dr. Levy's diligent and sound analysis promise massive health and financial benefits for each of us - and our country - that are vastly too rich to ignore! Buy a copy for yourself and recommend it to your cardiologist as well. 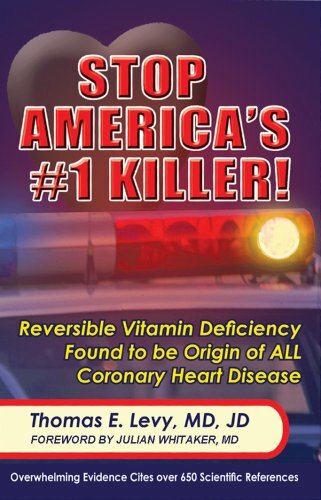 Write a Review of Stop America's #1 Killer!